MILLIONS OF NORTH Korean children are not getting the food, medicine or health care they need to develop physically or mentally, leaving an entire generation stunted and malnourished, the United Nations said today. Nearly a third of North Korean children under age 5 show signs of stunting, particularly in rural areas where food is scarce, and scores are dying from diarrhea due to a lack of access to clean water, sanitation and electricity, the agency said. Hospitals are spotless but bare; few have running water or power, and drugs and medicine are in short supply, the agency said in a detailed update on the humanitarian situation in North Korea. 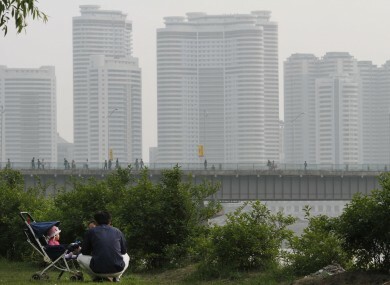 People in the capital, Pyongyang, live in relative comfort, but the situation in the rest of the country is more dire. About 16 million North Koreans — two-thirds of the country — rely on twice-a-month government rations, the report said. And there are no signs the government will undertake the long-term structural reforms needed to spur economic growth, it said. North Korea does not produce enough food to feed its 24 million people, and relies on limited purchases of food as well as outside donations to make up the shortfall. Malnutrition over a generation can have a long-lasting effect on a population in terms of physical growth, cognitive capacity, the ability to learn. The long-term effect of malnutrition can be very severe for a whole generation and on the whole population. The United Nations called for $198 million in donations for 2012 — mostly to help feed the hungry but also to invest in programs designed to mitigate and prevent a chronic food shortage that has resulted in persistent malnutrition among North Korea’s young. The appeal comes at a delicate time for North Korea, which has sought to put forth an image of stability and unity during the transition to power of the new, young leader, Kim Jong Un. Yet it has begun to publicly acknowledging a severe shortage of food for the first time in years. Email “Generation of North Koreans 'stunted and malnourished'”. Feedback on “Generation of North Koreans 'stunted and malnourished'”.